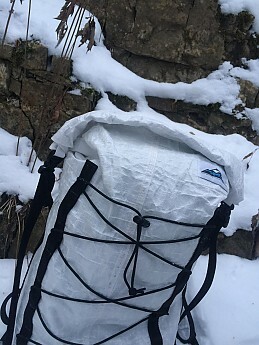 The Hyperlite Mountain Gear Dyneema Summit Pack is a minimalist 30L pack which uses a woven Dyneema face fabric to increase durability beyond any other pack I’ve ever used. The abrasion resistance, and to a lesser degree the puncture resistance, is superior to anything else on the market by a country mile. 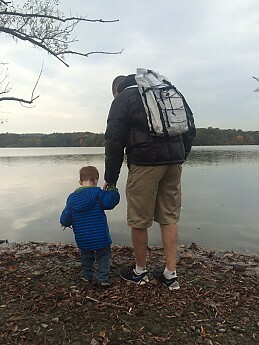 With a very comfortable fit, a roll-top closure, removable hip-belt and extra storage, in the form of criss-crossed shock cord, it is clear that Hyperlite Mountain Gear (HMG) has paid attention to the little things. Add in a couple small things, bivy pad and a small pocket, and I’d have no critiques left. 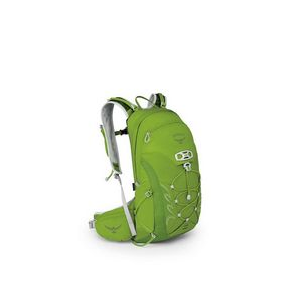 The pack is best for anyone who appreciates extreme levels of durability in their gear. It is however limited in its size to shorter outings. 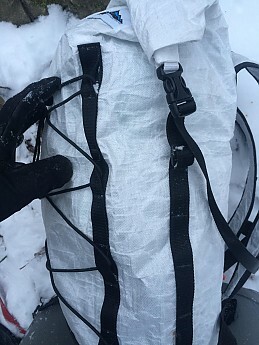 The more packs I have the opportunity to use, and test, the more I realize the value in two primary design decisions—durability and simplicity. The two are fairly interconnected, although one, or the other, is often poorly executed in the final pack design. This is especially true in packs designed for rock, alpine and ice use, less so in backpacking and hiking. They take an above average amount of abuse and need to function, without fail, as more is often at stake. Having a gear failure while climbing, rock or ice, can be dangerous at best, and deadly in the worst case scenario. 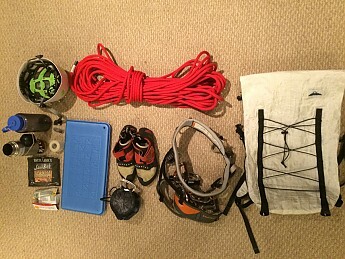 This little preamble is what leads me into the Hyperlite Mountain Gear Dyneema Summit Pack. While the name is a little long, and extensive, the pack is anything but, and I mean that in the best way possible. It’s a bag, with shoulder straps, that’s it! Okay it’s a little more than that. 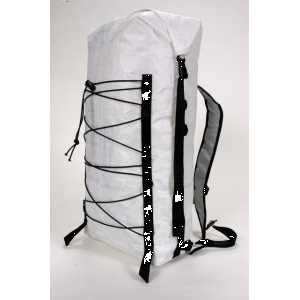 It’s a bag with perfectly designed shoulder straps, a roll top closure, daisy chains rigged with shock cord and made with the most bombproof, virgin white, woven Dyneema fabric. Doesn’t lose its technical integrity when folded or crinkled. On a weight-for-weight basis Dyneema is 15 times stronger than steel and 40% stronger than Kevlar. The majority of its uses are far more life dependent—armoured vests, boat moorings, surgical cables and orthopedic sutures. Or possibly the most bad, errrhhmmm, behind (this is a family-friendly review) backpack material made today. 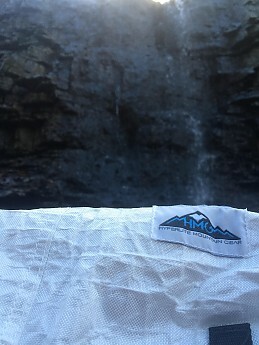 When laminated to the Cuben Fiber interior, that HMG usually uses, you get all those benefits plus the lightweight waterproofness of the CF and eliminate CF’s only real weakness, abrasion resistance. It’s a blissful combination that competes with the likes of PB and J, beer and a campfire, batman and robin—all great on their own, but when put together they are unstoppable. The Summit comes in only one size, so make sure it fits you before purchasing, by ideally trying it on, or at least measuring yourself and using HMG’s dimensions as a guideline. That said I’ve lent it to a couple people with very different body shapes and sizes than me, and all have found it equally comfortable. I have a 20.5-inch torso and have lent it to people down to about an 18-inch torso. All have reported back the same comfort level I’ve experienced. 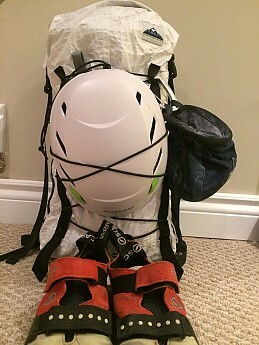 Being tall and narrow, a similar shape to the traditional bullet pack, with a little bit more boxy lines, the pack rides comfortably between the shoulders and out of the way of your harness or helmet. The size and shape of the pack give you full range of motion throughout your shoulders and does not hinder any dynamic movement of the hips. 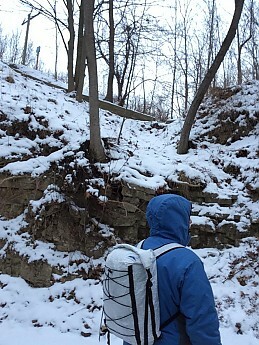 The Summit is a frameless un-padded pack. It requires careful selection of what goes where. The shoulder straps are wide, but unpadded. Poorly designed or executed this would be an uncomfortable match but these things are perfect. The slickness of the Dyneema fabric allows a little bit of movement without any of the chaffing or uncomfortable hot spots. I did receive the pack when the colder weather had already arrived, and hence thicker shirts and jackets. I’m interested to test it out in the warmer seasons for two reasons: one, the breathability, or lack thereof, of the shoulder straps and back panel, and two, how well the pack will carry without the extra cushioning of a jacket. I think it will be fine with both, as any time I’ve used it for more urban uses—grocery shopping, commuting, work, travel, etc—it has been quite comfortable. 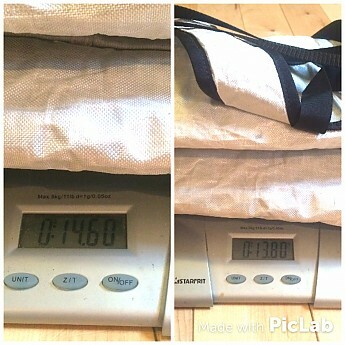 The stated weight carry recommendations are 5-20 lbs but I’ve found it quite comfortable in excess of that. Anytime I’m approaching the 20 lbs mark I like to put a blue foam pad inside the pack, against the back. 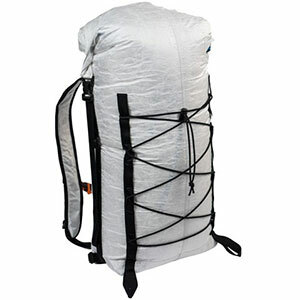 This does three things: one, it gives some rigidity to the pack to help with carrying comfort, two, keeps pokey things away from your back, and lastly, gives you an emergency bivy pad, or just something to sit on. I’d love to see this added. It is one of the very few things that keeps me from labelling it as “Perfect”. The fabric is thin so if you don’t pack it properly, especially without a pad, you’ll feel every cam, screw, or even your rope. 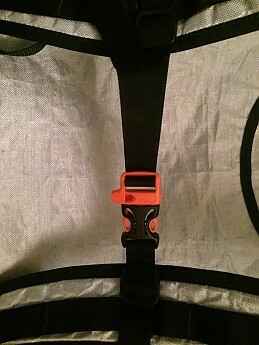 The sternum strap is adjustable and has the now common emergency whistle in a bright orange colour. There’s eight inches, divided up into 4 two inch increments, of webbing ladder to get the perfect fit. Also a small, but often overlooked, 3-inch piece of elastic runs for part of the sternum strap allowing it to expand and contract a little. The belt is ¾ webbing which is nice to sturdy the pack but is not designed to take any weight off of the shoulders. When climbing, mountain biking, or trail running it will help it from flopping around annoyingly on your back. Again paying attention to the small details that make this pack so great, it’s removable. I have it off probably 90% of the time. I like to just throw it inside the pack so I don’t lose it. When I do want it on it's super convenient to have, and easy to reattach via a ladder lock buckle. Throw it in the bag though so you don't lose it. 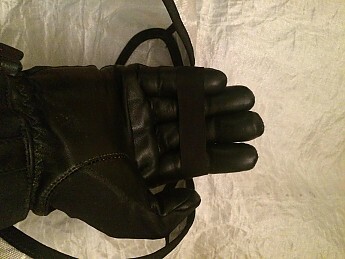 There’s also a nice sized grab handle that is sized well enough to work even with gloves on. The pack is advertised at 30L although it does feel smaller than that. I’m not sure if the listed volume is with the roll top closure fully extended. Compared to the Wild Things Guide pack which is 26L it feels significantly smaller. I’d say comfortably it’s in the 25L range, allowing yourself some room to roll down the top. It has a top circumference of 32”, 31” at the bottom and a back width of 10”. When fully unrolled it stands 27” tall, although as I said I don’t feel all of that is useable. 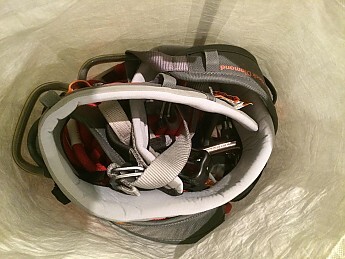 Once the pack gets too tall it starts to hit the back of your helmet, becomes too unbalanced and you lose the waterproof benefits of the roll top closure. Pare down your gear, bring only the essentials, or use the “I can’t fit it in my pack, I guess you have to carry the extra gear on the approach” excuse (works like a charm every time). 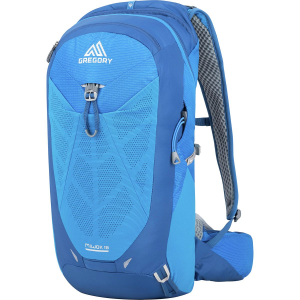 The webbing straps have shock cord criss-crossed across the back allowing you some extra space for anything that didn’t fit inside, or anything that got wet. 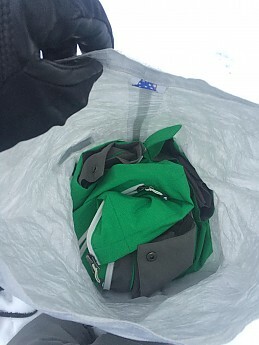 Helmet, jacket or tarp all fit nicely. All packed up, climbing shoes can fit inside, but I often clipped them to the daisy chain to air them out! Room to spare for shoes...if they didn't smell like a garbage can. For a day hike I carried a small alcohol stove and fuel, 750ml pot, ramen noodles, 2L of water, dog food and bowls, torso length blue foam pad, extra jacket, and a small first aid kit. Lots of room left. The other thing I love about this pack is the, wait for it, packability! The Dyneema fabric gives you the durability without the bulk. A pack of comparable size/durability made with another fabric wouldn’t be able to fold down nearly as small, or weigh nearly as little. 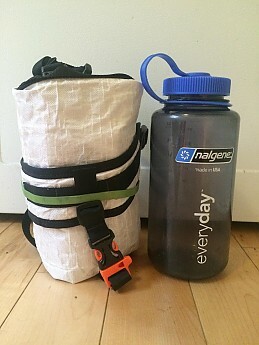 It only weighs 14.6 ounces (less than HMG claims) with the belt, and 13.8 ounces without, and it packs down to the size of a Nalgene. Easy to throw into a larger bag and easy to tuck away when you don’t need it. One liter Nalgene for comparison. Weights with, and without, hip belt. It’s one large sack. End of this section of the review. Okay fine. You do have to pack smart, and the more you use it the more you’ll figure out what works for you. 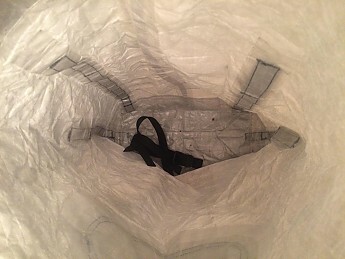 There’s no internal pockets or lid to keep the small things organized, so I use a small cuben stuff sack, to keep stuff I need easy access to, separate. Wallet, phone and keys when commuting, lip chap, headlamp, and knife when climbing, for example, all things that would fall to the bottom and be annoying to dig for when you want them. 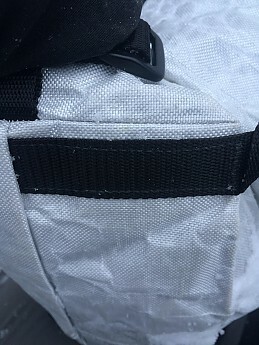 One small exterior pocket would be extremely convenient, something like the one on the Arc’teryx Alpha FL, which, in my opinion is the closest, most comparable pack being made. Two daisy chains on each side. HMG does make a Summit pocket which lashes to these, I will most likely be purchasing it. The fact that it is entire white certainly makes it easier to find objects inside though. My one small gripe here, and I understand why they did it, is the ice axe loops. It’s the most outdated way to carry an axe, and Hyperlite knows it (just look at their Ice specific pack where they use the far superior tools sleeves). The loops serve more uses for carrying trekking poles, a tripod, or bike lights though, so I guess versatility won out here. The pack utilizes a roll top closure so you can decrease the volume by continuing to roll down the top. There are no side compression straps, but the pack is on the smaller side to begin with so they would just be superfluous. Cinching down the back shock cord pulls the load in nice and tight to the back. I’ve lumped three categories together here for a reason. Let’s be honest, there are a million packs, made by a million different manufacturers, that are as “simple” as the Summit. Two shoulder straps and a bag. Simple. 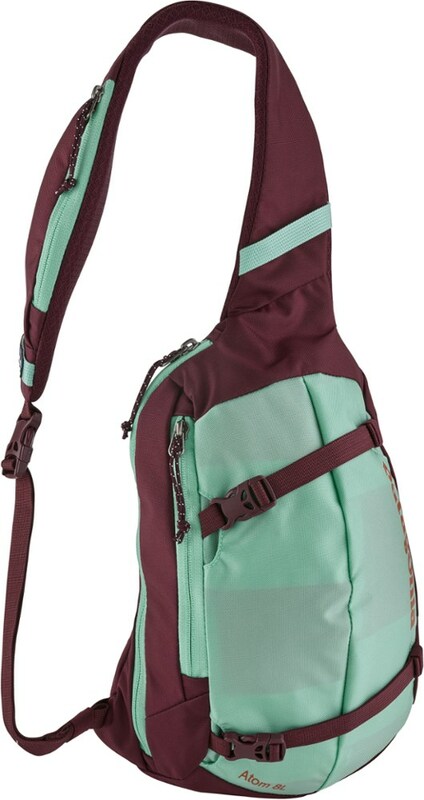 Now design a perfect fit, add the back shock cord, a removable hip belt, waterproof fabric, and a roll top closure. Well that eliminates over half the packs made. 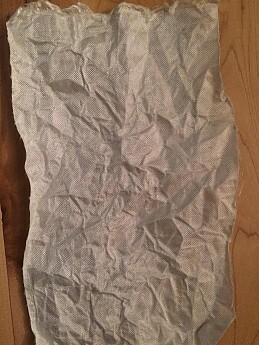 Now make the face fabric out of woven Dyneema. We’re down to two companies that I know of, and the other one is almost double the price. The price is high, there are some people that are going to inevitably say it’s not worth the money, or they can get three packs for that same amount of money. Personally I value durability and would rather have one pack last ten years then three packs last three years each. My testing pack has absorbed some dirt stains on the bottom, but the Dyneema fabric has laughed off everything else. Shoved in and out of the gym locker, thrown down, sat on and climbed out of, dragged across rocks and bushwhacked through briars with nary a mark. When initially asked to test the Summit pack I had inquired if Hyperlite would be able to include a small sample of the Dyneema fabric. Knowing the extreme cost of it (the suppliers of woven Dyneema are very few, so don’t expect it to go on sale anytime soon) I expected to be turned down, or at the most maybe be sent a little 3 by 3 inch square. Imagine my surprise when a 13 by 14 inch square was included with the pack for testing. I gave them full disclosure of my intentions to attempt to fully test the limits and destroy the fabric. My only instructions—“Don’t set it on fire!”—and I think even that was in jest. I received the pack and fabric October 20, 2015. From then on my mind immediately went to devising some sort of testing gauntlet. The first thing I wanted to do was to cut the swatch of fabric in half, one to show what it’s like brand new, as a control, and one to treat less than kind. I dulled two pairs of scissors, had one pair professionally re-sharpened, and finally made it through the required 13-inch cut. Step one: Since then it has sat outside with weights on in, exposed to the sun, rain and light snow that has made up the past two months. Step two: December 21, I brought it inside to begin folding it repeatedly. Every night when I sat down to watch T.V. I’d sit, and in a little shade of OCD (or a child holding a blanket! ), I’d fold, stretch and crinkle it. With some fabrics you can actually degrade the fabric to failure, or at least weakness, this way. Besides some ketchup stains, no luck. All the critical points are bar tacked. All sewing is top notch. 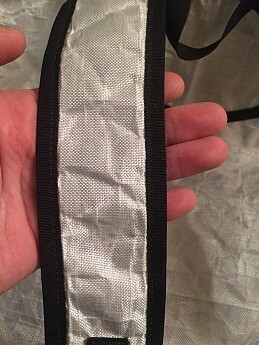 There is a seam that runs along the entire length at the base of the pack. It worries me a little because I think that would be an easy place to get dirt into and eventually break down the seam, or water to enter—nothing so far though. 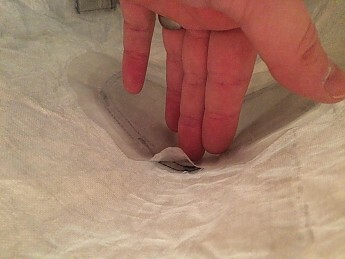 Interior seams are sealed, although the shoulder strap seam tape is peeling off. I’ve reinforced them with some Tenacious Tape. Time to stop this madness. 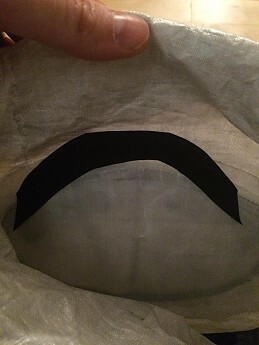 The tape has held for a couple weeks now, and bonus, it looks like my pack is wearing a mustache! 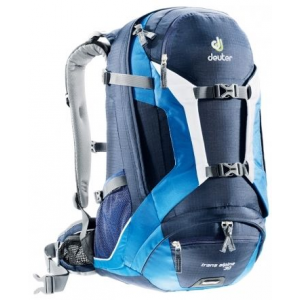 All the plastic buckles, straps, shock cord, basically any weak point on the pack is easily user replaceable. You also get the quality control that comes with a locally made product, and the lessoned environmental impact. The Hyperlite Mountain Gear Dyneema Summit Pack is a premium priced product that backs it up with premium performance. Luckily it doesn’t just talk the talk, it walks the walk as well. 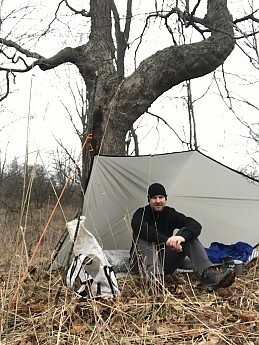 Whether you are hard on gear, a professional guide that lives out of their pack, or just someone who values durability, the woven Dyneema fabric is unlike anything I’ve ever tested, especially when it comes to abrasion resistance. The size bodes well for day hikes, crag climbs, ultralight overnighters, commuting, or summit pushes. The best features are the woven Dyneema, the fit, waterproofing and roll top closure. If HMG were to add a removable bivy pad and a small exterior pocket you’d be looking at the perfect pack. It’s so close to perfect that I decided to give it five stars in spite of those (relatively) small omissions. I’ve had the chance to test this product over a three-month period. It has fended off three-hour long downpours without a drip inside, snow bounces off it like armour, and rock abrasion might as well be as damaging as a soft teddy bear. 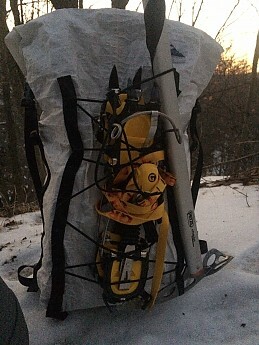 I’ve climbed (both at the crag and gym) out of it, commuted with it and packed it in larger bags, gone for trail runs and hiked with it in temperatures varying from -24°C to 16°C. 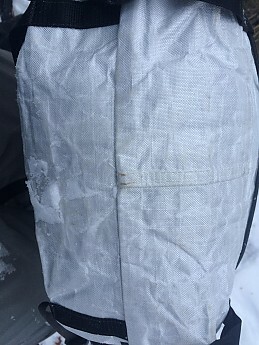 At the time of the review winter finally decided to arrive in the Northeast but I also see it as perfect day ice pack, I’ve only used it like this once, so I’m holding off judgement on this for now. 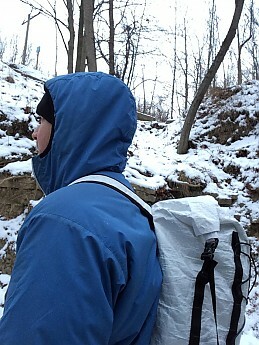 *My thanks to both Trailspace and Hyperlite Mountain Gear for the opportunity to test the Dyneema Summit Pack. I have continued to use this pack and have found my initial impressions to be correct. 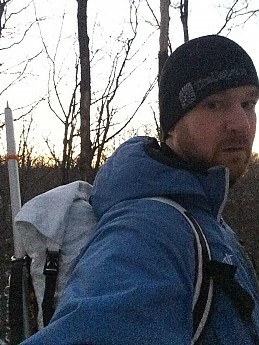 Recently I was able to take it for a winter overnighter (a mild one, but still winter). Incredible review, Jake! 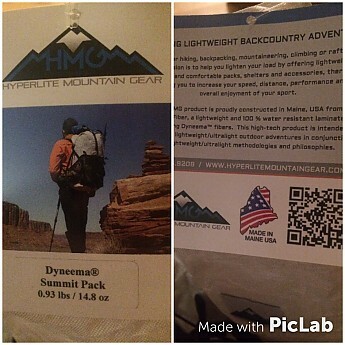 Thanks so much for such a great field test and thorough review of this HMH pack and of the Dyneema fabric. I'm also glad to hear that it was a worthy and interesting pack to test. It's a good day when a review gets compared to Mythbusters! Im probably the least scientific Mythbuster ever! Hahaha, thanks guys. Thanks for the update, Jake. Looks pretty mild up there. No way this deserves 5 stars! The fabric is fantastic and the design works for me since I was not looking for anything complicated. Top closure ensures it will resist a storm but seam tape around shoulder strap stitching is already failing after a single light use. At this price I can’t see how this can be justified. Also, I got mine and it is missing the compression cords, which for me indicates sloppy QA prior to sending it. The seam sealing is the same thing. After sales service from HMG to resolve the issues made me revise my rating and add 2stars. Interesting perspective MML. As you can see I am the one who gladly gave this pack 5 stars and would give it 5 if I had to rate it again. I use this pack more than any I've ever owned. 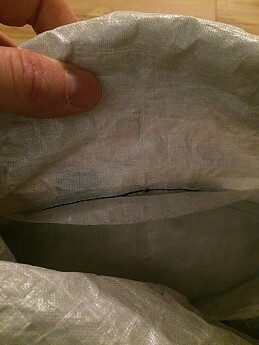 The seam tape peeling is slightly annoying (happened in my pack as well, pics in review) but finding tape to stick to a frequently folded area of this material is difficult. 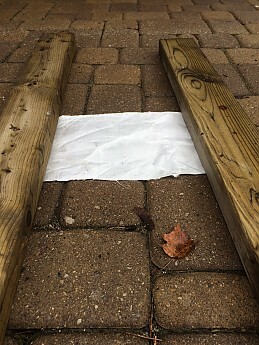 A little tenacious tape lasts a few months and then I just retake it, or don't worry about it if the trip isn't going to be wet. The lack of the bungee cord is weird. I can't believe no one at HMG noticed that before shipping it out the door, definitely an oversight. Welcome to Trailspace, MML. Too bad about your disappointing experience with this pack. 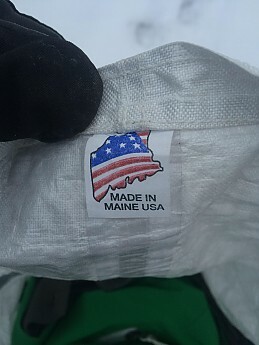 Do you have any pictures of your pack you could add to your review to show others the specific issues you had? Also, did you notify HMG of the problems? Have you contacted Hyperlite about the missing cords? They might make good on the error. 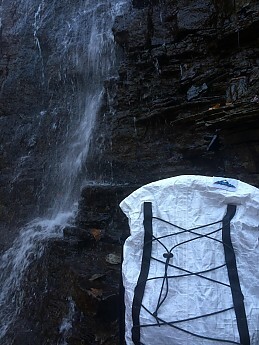 I had Kelty do a repair on one of my packs. The damage was my own fault, but they repaired it for free. Jake - If the seam tape doesn't hold, it's a design flaw. The missing cord is being addressed by HMG and they also proactively addressed the tape issue. But still, both of us have this bag and both of us have the exact same issue so the problem is a known one for sure. I must admit that the maker is showing great service and that's definitely worth something. Thanks for letting us know how HMG has responded, MML. 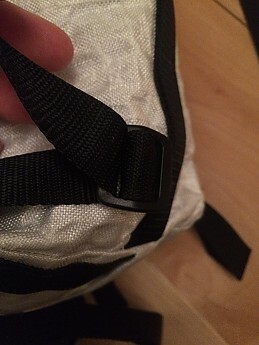 Absolutely, I'm not denying the seam tape issue needs addressing, I'm just not sure theres a product that exists that'll stick and deal with the repeated folding from the roll top closure. Out of curiosity what would you rate that bag had it come with the bungee cord? The after sales service HMG provides is probably the best I ha e experienced. I still consider the seam tape an issue but the service these folks gave me made the experience world class. Thanks for the service update, MML. 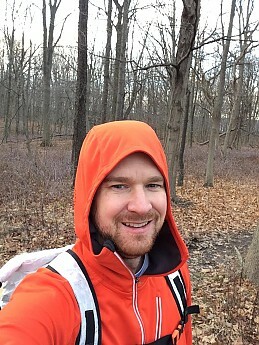 The author of this review takes photos for Hyperlite Mountain Gear under a contract. The Hyperlite Mountain Gear Dyneema Summit pack is probably the simplest, most indestructible, lightweight pack I've ever owned. It's withstood many summits in the Eastern Sierras, slot canyons in southern Utah, peak bagging in the White Mountains in New Hampshire, and even some minimalist two-day trips into the mountains. The design is very black and white. Pack most of your stuff in the single roll-top closure compartment, and clip anything else you might need to the outside. Like everything else produced by HMG, the Summit Pack is built to last and built for simplicity.